Blockchain is a way out of most of the economic and financial problems of the world. Still though in its nascent stages, it has begun to revolutionize the whole world. Some of the major corporations of the world have begun to scratch the surface of the technology. It is a contemporary living example of how a revolutionary technology emerges from its fetal stages into growing wings. When banks pulled out of smaller economies citing loss as in the Caribbean islands, blockchain came to the rescue. Trade and inward remittances began happening through shared ledgers using bitcoins. The limitations in centralized conventional banking systems did not allow for profitable transactions to take place in smaller economies. Unable to work around the system and the regulations, banks pulled out to make way for blockchain technology. Smaller economies, especially, have begun lapping up the technology to overcome the limitations in conventional banking. So, stock exchanges like NASDAQ and many other banks around the world have begun testing this new technology. With the Philippines being a fine example, remittances around the globe have started happening through bitcoin currency and distributed ledgers. Each country has a different regulation when it comes to inward and outward remittances. Since blockchain technology eliminates the need for any intermediary, peer-to-peer and business-to-business transactions are made easy, unlike conventional banking. Both domestic and international payments can happen quite easily through the blockchain mechanism. Digital identity will form part of one of the most important of functions of blockchain technology. KYC processes throughout the world have been under fire for all their complications. Hence, blockchain-based KYC is the future with its distributed ledger technology. It is sure to make KYC processes easier, transparent and highly cost-effective, due to its shared, decentralized and verifiable nature. Digital identity gives rise to the recording of digital and smart assets in the blockchain. An individual’s entire portfolio of assets and ownership goes into the shared ledger, which remains anonymous, verifiable and immutable. Digital identity and digital assets will become immediate parts of the blockchain, as soon as the technology goes fully ripe. 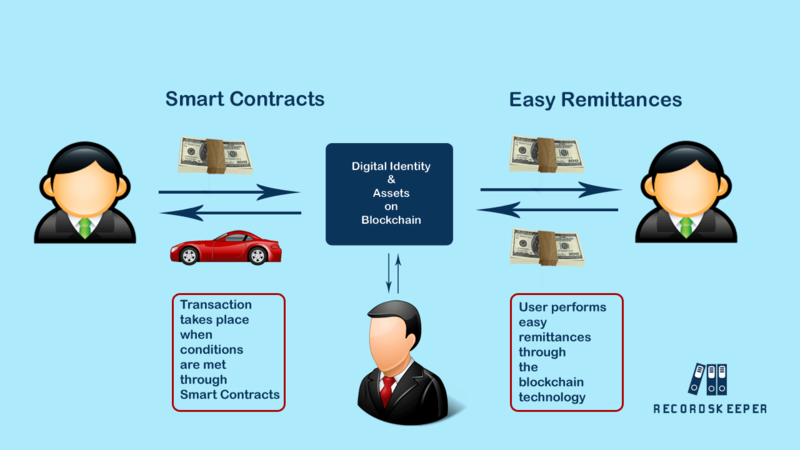 A Smart Contract is just like how blockchain functions but with the pre-programmed terms of a contract. Execution of the contract happens on its own, when both the parties fulfill the conditions laid out. The smart contract program, upon agreement of price between the two parties, executes the contract and performs the transaction automatically. The software verifies the owner, performs the transaction and ships the product or transfers ownership registrations on its own. Smart contracts can execute purchase or sale of the house, cars, financial instruments, marriage registration, divorce, property registrations, etc. without human intervention. The benefit is that it eliminates intermediaries as banks and brokers or agents and the individual performs the entire transactions on his own. The key use cases or application of blockchain technology will multiply in the coming years. It will take over most of the processes of many industries all over the world. It is also set to become an integral part of human lives in all our day-to-day activities.